Latest Update: V2 -29 Sep – Team and driver changes since printed guide went to press. Note: NGT have since withdrawn. 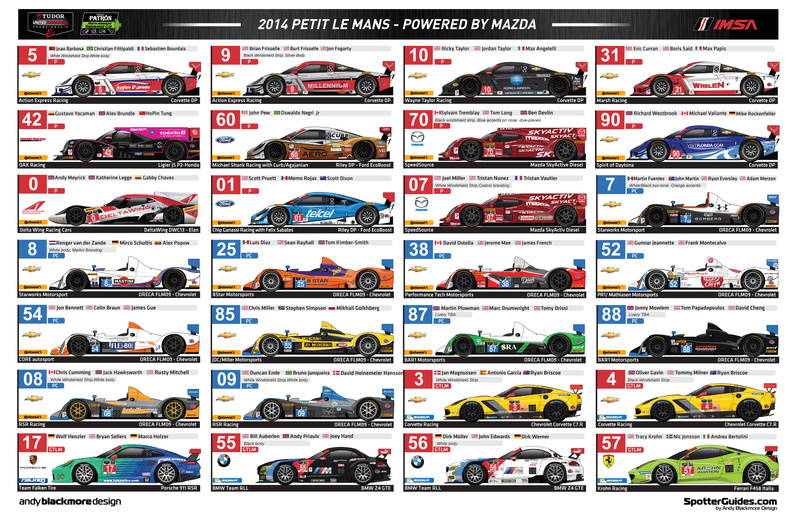 Welcome to the TUDOR United SportsCar Championship and Continental Tires Sports Car Challenge Spotter Guide Page. 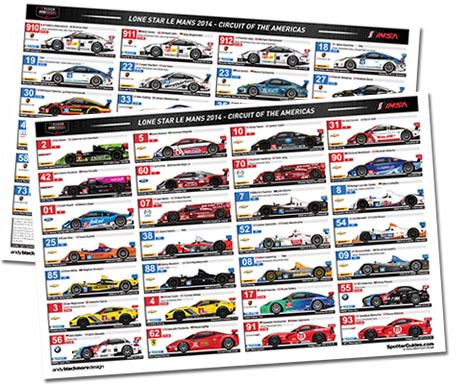 After a successful six years producing the official American Le Mans Series Spotter Guide, race car livery designer, Andy Blackmore has partnered with IMSA to produce a new Fan Raceday Viewing Guide for 2014. 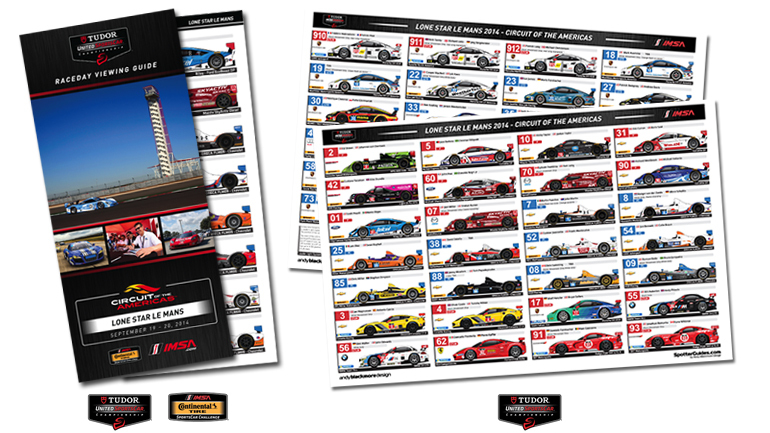 The new style guide for the final round of the series includes the PC, GT-LM and GT-D classes in the TUDOR series and the CTSCC classes, featuring their liveries, driver rosters, chassis, engine and class details. 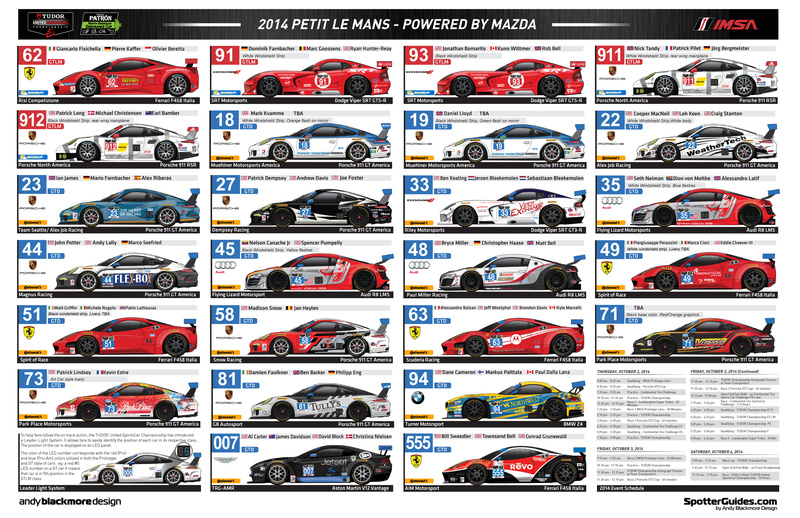 As a special feature, the Petit Le Mans guide is available as the usual multi page IMSA viewing guide AND a two page 11×17 ‘Poster style’ Spotter Guide. You can download the guides here. 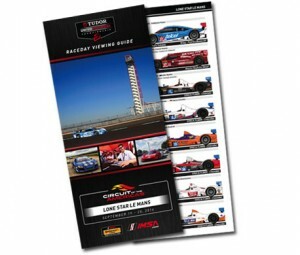 Special thanks to IMSA for sponsoring the Viewing Guides and giving approval for the creation of the Poster Style Guide for CoTA and Petit Le Mans. 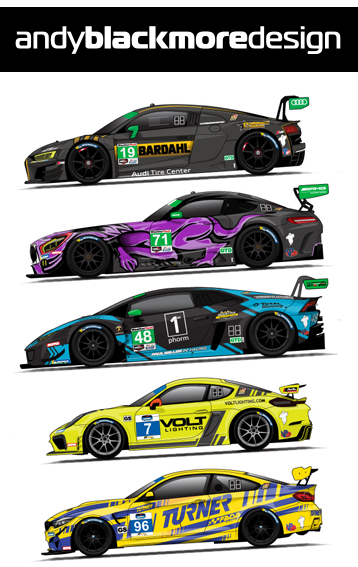 A number of cars designed by Andy are also in the guide including the DeltaWing, PR1 Oreca PC and Turner Motorsports BMW Z4 GTD in the TUDOR Series, the ‘fleet’ of Bimmerworld BMWs and CJ Wilson Mazda MX-5′s in the Continental Tires Series. 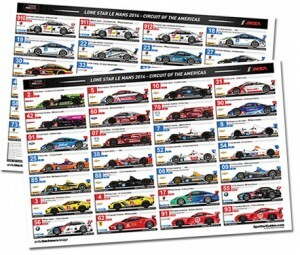 The viewing guide is produced, race by race by IMSA and Andy Blackmore Design and is available in printed form at the circuit or the online version available above, and the individual race details page of IMSA.com will provide you with the latest liveries and entry list. It is a big download to ensure high resolution. Notes: Please fill free to share the guide on Social Media, but please link to this page and not the guide (as file names change with updates) so your friends and fans can download the latest version of the guide! Thanks – Thanks to all the teams, drivers and sponsors who supported the production of the guide and car illustrations. To IMSA for helping to bring this to life and to the media partners and supports of Andy Blackmore Design and SpotterGuides.com for their continued support. Special thanks to the many teams who passed on designs before they were in the public domain.